Coffee beans were most definitely harmed in the making of these cufflinks. 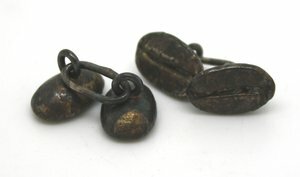 Coffee beans are generally harmed in the making of all of my jewellery, but these more than most, as they are cast from a real coffee bean, with all of its details. Except for the caffeine, but I am working on that. The finish is an antiqued look to look even more like the original, but please remember not to put these ones in a grinder.